September 29, 2015  In his U.N. speech, President Obama cited improved ties with Cuba as an example of his commitment to diplomacy. 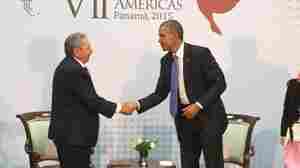 But in his remarks, Cuban leader Raul Castro laid out a series of demands. September 27, 2015  It's been one year since 43 students in rural Mexico disappeared after being attacked by police officers. As protesters mark the anniversary, new theories have emerged about their disappearance. September 26, 2015  Since Syria's civil war, Brazil has quietly accepted more Syrian refugees than any other country in Latin America. Those refugees are now building new lives and connecting with Syrian history there. 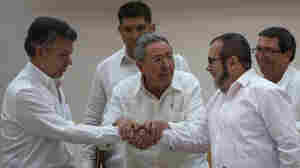 September 24, 2015  The Marxist revolutionary group known as FARC has been fighting the Colombian government for over 50 years. Thanks to peace talks in Havana, Cuba, the fighting may finally come to an end in six months. September 24, 2015  Plus, a goalie in the Mexican soccer league scored on himself when he inadvertently threw the ball into the head of an opposing player and it rebounded into the goal. September 22, 2015  Pope Francis arrived Tuesday for his first-ever trip to the United States. He came from Cuba, whose warming relations with the U.S. are due in part to papal mediation. September 21, 2015  Pope Francis took his message of grace and forgiveness to the eastern Cuban city of Holguin Monday where he blessed the city and held a public mass. September 21, 2015  The pope spent his first full day in Cuba giving a mass to crowds gathered in Havana's Revolution Plaza, meeting the former president and speaking with Cuba's youth.